Susan Jones is a very diligent researcher, and a great source of information in matters pertaining to the Massey Tunnel Replacement Project. She circulated the following bunch of clippings to the Fraser Voices group. I thought that my readers would appreciate the following and I encourage them to spread the word. There are definitely plans to dredge 34 kilometres of the Fraser and the BC Government has been involved in the planning. It is the $90 million Fraser River Channel Deepening Project to dredge the navigation channels from 11.5 metres to 12.8 metres. One source of information is found on the Corporation of Delta website. “Thank you for your letter dated February 2, 2015, providing support to the Gateway Transportation Collaboration Forum (GTCF) and direction for us to work with your recommended staff. 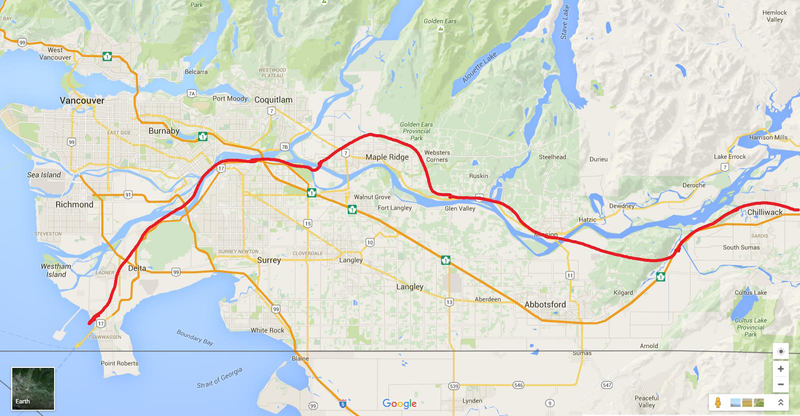 potential gateway-related infrastructure projects of national significance in Greater Vancouver. A material enhancement project to increase the depth of the Fraser navigation channel, from km 0 to 34, from its current draft of 11.5 meters (m) tidal to to 12.8 (m) tidal assist. I was a bit stumped by the challenge this week. I was wondering how you can use one picture to illustrate the process of change. When I have tried to do that myself I tend to use more than one picture and either post as a diptych or triptych (don’t worry there’s a website for that). 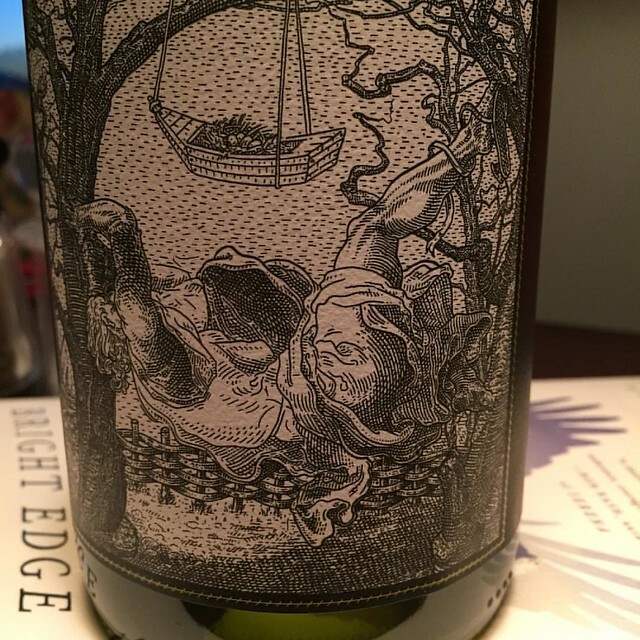 So I started scanning my flickr stream and came across a wine bottle label. It has a picture which actually changes as you look at it. It can either be a skull, or someone falling out of a tree. What seems to be a row of teeth is a wattle fence. Transmogrification right before your very eyes! The wine is a South Australia Chardonnay vintage 2013 called Skulls. It was quite nice really. But what makes you pick it up in the store is the label, which is very clever marketing. This is a puddle in the parking lot of Kits Beach Park: we have been having a lot of rain lately. Together with a painful toe condition (rectified on Friday afternoon) that has been restricting the amount of time we have been walking and cycling. So the number of photos I put on flickr and instagram dropped. So that has been rectified too. This post is also being created on what WordPress calls its new improved editor. I suppose I just got used to old one, and I still prefer to post that way. And this is the first time I have used this blog to respond to a photo challenge, and, given the response to this one, is unlikely to be the last. Canadians did not vote for this. The expectation they had was that electing a Liberal government would produce a rapid, radical change of direction from the Conservatives. Instead of that we have seen what is apparently always the way with Liberals: campaign on the left, govern on the right. It was certainly my bitter experience in the first Canadian election I was able to vote in after I became a citizen in 1992. I read “The Red Book” which set out a Keynesian agenda for the country, so I voted Liberal. Then Paul Martin became Finance Minister and we went on with all the conservative policies I had voted against. Of course I did not get caught twice: I voted Green last time. Not nearly enough people did that, so we are forced to repeat history. So we can now add loss of land from the ALR to the Site C project, the Lelu Island LNG project and the almost certain federal approval of the Kinder Morgan pipeline expansion to the “sunny ways” of our new Prime Minister. Yes, I am sure he looks very appealing to many when he takes his shirt off. But I do not think that is nearly enough to justify his policies. continued by this government. Of course, if I do find myself without citizenship I will not actually be able to prove that it was environmental activism that was used to brand me a terrorist – but that is already happening. Is Trudeau any different than the old boss? Yesterday I went to a meeting of All Aboard Washington “a consumer transportation advocacy group, comprised of nearly 500 people who have a goal of preserving and expanding passenger rail service in the state of Washington”. 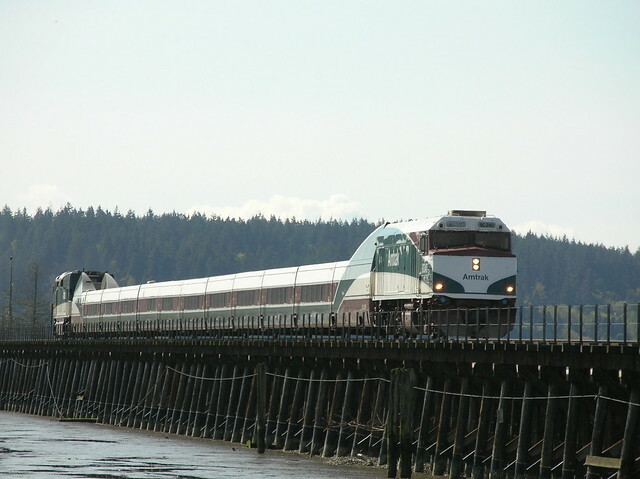 They had invited Transport Action BC to attend the meeting, as much of it concerned the operation of Amtrak Cascades. They meet monthly and the meeting at the University of Western Washington in Bellingham had around 50 people, I estimated. Invitations had also gone to BC officials but only one attended, Councillor Grant Meyer of White Rock, who gave a short presentation on the proposed real relocation project. 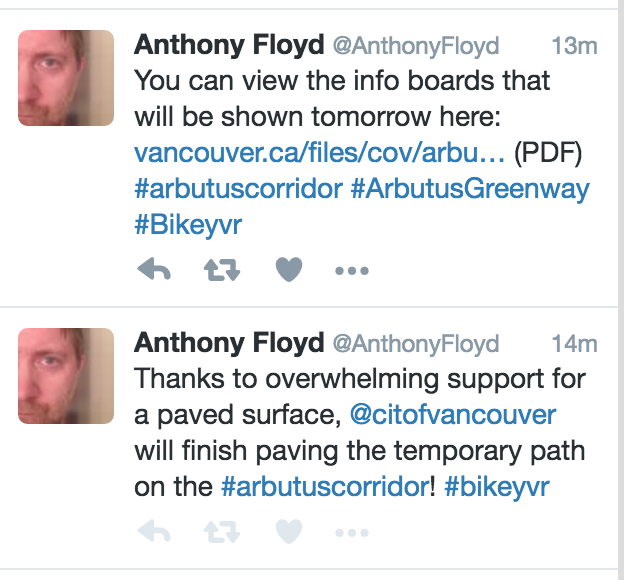 Surrey MLA Marvin Hunt had been expected to attend, but he sent his apologies. Speculation was that he had been instructed not to appear, and certainly speaking of a looming election here (next May) when one is happening next month in the US seemed inappropriate. I have managed to find some of the materials from the presentations, so that you will not have to rely on my rather rusty note taking. Lloyd Flem AAW’s long serving Executive Director opened the meeting with a short history of Passenger Trains to Bellingham. Much of this will be familiar to readers here, so I will just mention some highlights. The Washington State talks of an objective of 4 trains a day between Seattle and Vancouver BC by 2035, but 13 between Seattle and Portland OR. The challenge lies in the capacity of the single track line from Everett through Mount Vernon to Blaine, and the lack of investment north of the border. BC did spend $7m on a slip at Colebrook as a contribution to get the second Cascades service in time for the Olympics. Unlike Washington and Oregon, BC provides no operating subsidy for the service. Considerable work was achieved on the line due to the reallocation of High Speed Rail funds after Florida decided not to proceed. The route between Vancouver and Portland is identified by the US as part of its desired HSR initial network, and that has been endorsed by both the BC Premier and WA State Governor. The Asia Pacific Gateway was cited as an example of Canada’s commitment to infrastructure spending. Nine rail overpasses were built over the Roberts Bank corridor as part of the billions spent on port expansion. The use of P3 funding was also mentioned. The future of the passenger rail is that there will be no further HSR money, and no capital funds from Olympia but it might be possible to upgrade the capacity and provide some overpasses through the colocation of utilities such as water mains and fibre optic cable in the right of way. Bruce Agnew of Cascadia Academy and Bob Lawrence of AAWA spoke about the possibility of a third train to serve the line between Bellingham and Seattle. This would replace the current bus and would increase the utilisation of existing equipment. Ridership from Bellingham is currently 51,000 by train, 13,000 by bus and is the 6th busiest station on the service, and the 7th highest revenue. There has been a decline in travel in recent years on the bus service. Laurie Trautman, Director of the Border Policy Research Institute (WWU) spoke about the proposal to introduce pre-clearance for passengers in Vancouver. There is a pdf of the study as a research brief. Currently there is pre-inspection for immigration only as the result of an informal agreement: pre-clearance requires legislation. This is mainly about protection and liability issues affecting armed TSA staff operating in Canada and requires Congressional approval. [Nothing specifically was said, but I was left with the impression that this is highly unlikely.] The five border crossings between Point Roberts and Sumas are some of the busiest crossings on the border, but travel has been much affected by the exchange rate. 80% of the cross border trips are made by Canadians, with shopping the primary purpose of 31% of them. There was a presentation on student travel at WWU which I think is of little interest to readers here. Essentially, use of transit has been increased by the introduction of a UPass which has also seen increases in local transit services to meet demand. There is an identified need for a better connected passenger rail system across the state to better meet the needs of post secondary students – and others. Students at WWU have conducted a feasibility study of adding an additional stop at Blaine station. There is a pdf of their report on the AAWA site. The current shoreline route is vulnerable to sea level rise and more extreme weather events due to climate change. There have been landslides (4 to 5 a year) and erosion along the route and the increasing number of trains, between 16 and 20 day some with 120 or more cars, gives concern for pedestrian safety. The carriage of dangerous goods is also a concern in the light of the Lac Megantic disaster. 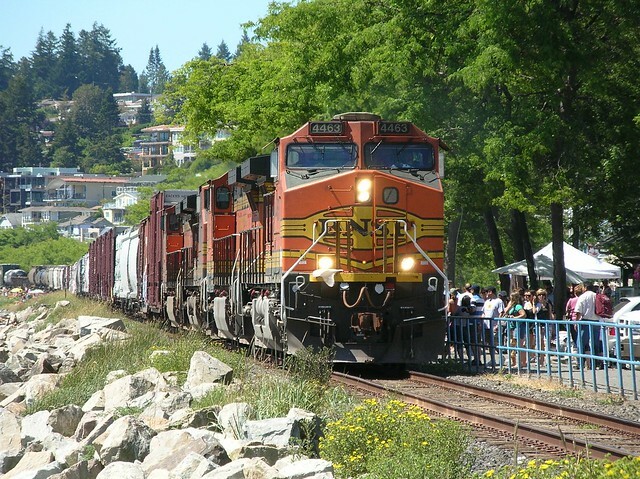 The community in Crescent Beach gets physically cut off when a train stops on its crossing, and an overpass there is both cost prohibitive and would have a huge impact. Trespass on the railway is frequent but may be reduced by the extension of the walkway from its present 2.2km to 3.3km: a lease amendment request has been made to BNSF. 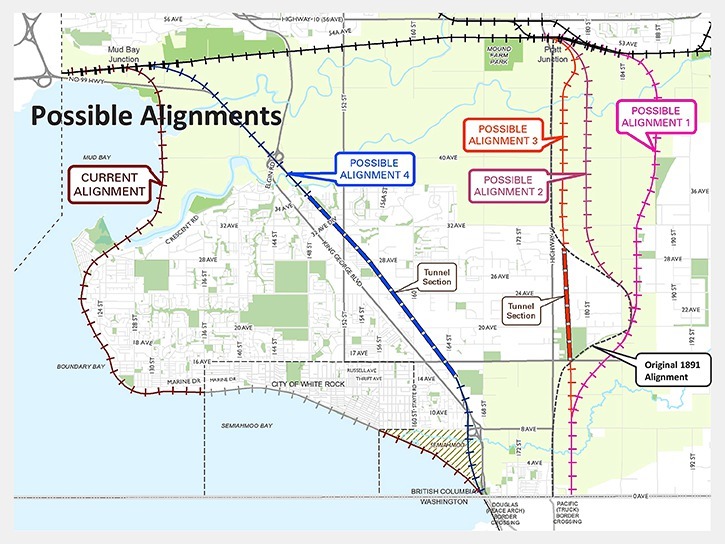 The four possible routes shown here have three options which would require rail relocation in Blaine, which may be a significant issue there. The fourth, westernmost alignment, while requiring expensive tunneling would avoid the need to relocate track in Washington. While the initial studies have been done more work is required to produce the full cost benefit analysis required by the CTA. Prime Minister Trudeau’s interest in increased infrastructure spending was cited as a reason for optimism. The relocation of the track would produce at least 15 minutes of travel time savings on the passenger service. The loss of the scenic ride along the current route seemed a reasonable trade off. I know that I have written about this idea on here somewhere before, but it really seemed to me that Tanvi Misra missed a few very significant issues. For a start the idea was dreamed up by an American “originally from a small town in Colorado”. If he had tried this idea in New York he would have got an even more irritated response. Life in big cities anywhere is going to be different from small towns. When I commuted in Toronto, both on the TTC and GO, it really wasn’t that much different to commuting in London. Possibly slightly more polite, but no-one expected to chat. Victoria was quite different. The people on the bus I used – same bus, same times every day – soon regarded me as a “bus buddy” (I term I had never heard before). But then Victoria has one very big employer – the BC government – and most of these people were using the then new innovation of the annual government employee bus pass (paid for by payroll deductions). So right off the bat there was something in common. We were by no means as anonymous as most London commuters are. That is not to say that there are not little social groups of regular commuters in big cities. I knew of several card “schools” on the Southern Region (as it was then known), for instance. 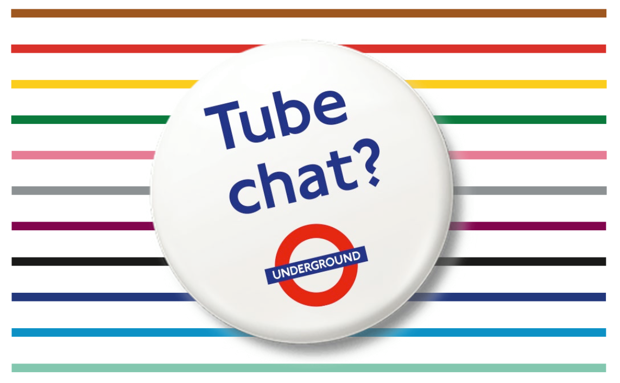 But the biggest mistake I think Jonathan Dunne made was using London Transport’s typography and house style in his badges and literature – including the famous roundel symbol. 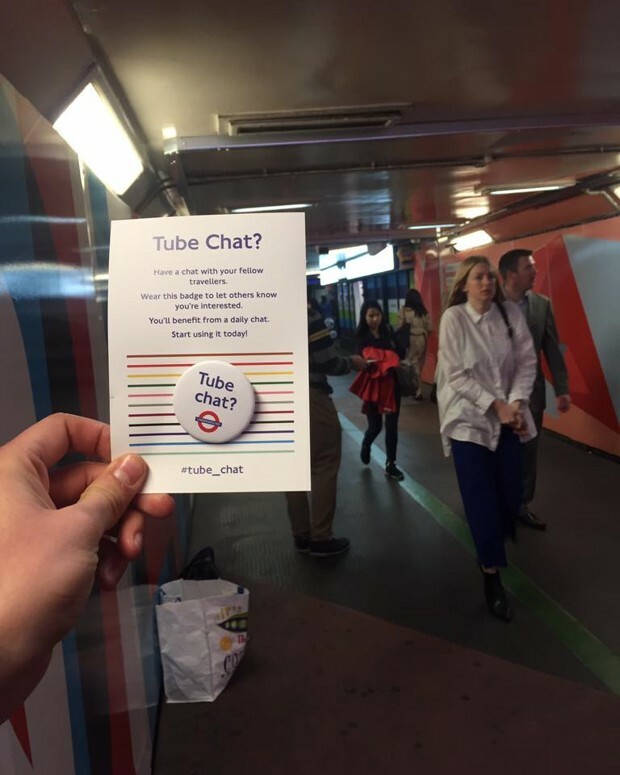 Intentional or not, this made it look like something promoted by Transport for London. Actually kudos to the kvetchers who made their ripostes look equally official. I think a lot of people would resent this intrusion much more if they believed it was something to do with officialdom. The clanger – “Keep Calm and Carry On” – has been equally widely misunderstood. When I was a London commuter, I actually looked forward to the trip every day. It was a very useful interlude, back in the days before cell phones. You were literally out of reach. I used to read the Guardian every morning on the way to work – and a library book every evening on the way home. I chose routes and modes that were reasonably likely to provide me with a seat most days, or at least adequate space when standing. I know that I wasn’t wearing a button that said “please respect my right to privacy” because that was widely understood, and didn’t need to be explained. Except to American tourists. We lived on one of the lines that terminated near Windsor Castle. Subsequently I have discovered that I quite like talking to strangers. Though I really cannot bring myself to emulate Brandon Stanton.